Although ABC3D came out only a few months ago, it's popularity rose quickly, even during its test print days. 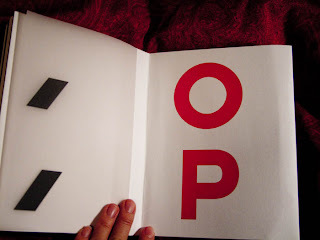 The design by Marion Bataille is so simple yet innovative and completely transforms how we approach the pop-up book genre. When I first saw the video, I knew I had to get one when it came out. 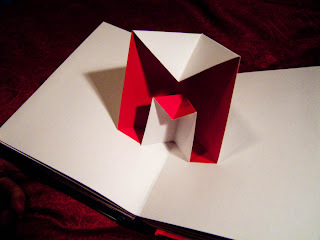 This 3D book is fun and interactive. 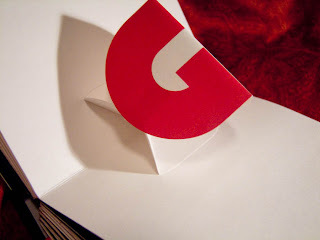 From A through Z, every letter has its own unique design. The simple act of turning each page transforms each character out of the page and brings hidden pieces into view. 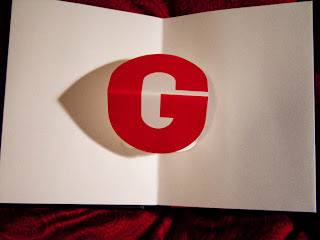 I love the clever typographical change as a smaller G twists 90-degrees and unfolds into a larger G when the page is opened up completely. ABC3D explores the 3-dimensional possibilities of shapes and space in each of the 26 letters, as well as each character's intimate relationships with those surrounding it. Our familiarity with the sequence fuels our anticipation for each subsequent letter, and we are always pleasantly surprised by the resulting delightful design. ABC3d is a mechanically clever and beautifully crafted work of art. But perhaps even more impressive was their ability to mass produce it! 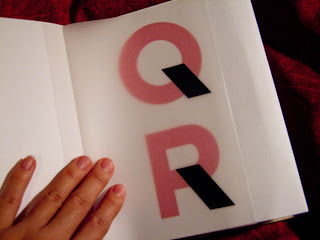 Even if you don't feel like shelling out $20 for this amazingly designed piece, I highly recommend finding a copy at a bookstore just to experience how exciting re-learning the alphabet can be. this is beautiful!! we should totally try to make our own! btw, i love this blog a lot! it gives me exposure to some forms of art i may otherwise never see!